For the last part of my fashion week partnership with TRESemmé, I wanted to share how to recreate wearable versions of some of my favorite runway hairstyles! I loved the twisted ponytails that TRESemmé created backstage at Marissa Webb and the effortless fishtail braids that accompanied the Alice & Olivia presentation. This is a look that incorporates elements from both, and takes me under 15 minutes to do! It’s a versatile style that you can wear with cozy knits for a casual Fall look, or I can easily see it dressed up with a flowy piece for a more formal occasion. Continue reading for the step-by-step instructions! Prep: This is one of those styles I love for day(s)-old hair, as the oils from unwashed hair will make it better to sculpt with. If you have freshly washed hair, I like to add some texture with a sea salt spray like TRESemmé’s Perfectly (un)Done Sea Salt Spray. Spray this generously into damp hair and blow dry until your hair’s about 80% dry, then finish blow drying while twisting sections of hair. This will give your hair a tousled, beachy texture that allows twists and braids to grip and hold better, instead of slipping through. 1. Start with a deep part to one side of your head. 2. Use your fingers and pick up about a 2-inch wide section of hair. 3. Start twisting this section of hair in the direction away from your face. Scoop up pieces of hair from the back of your head, bring them around, and incorporate into the twist as you go. Don’t worry about the twist being perfect! 4. Once you reach the nape of your neck with the twist, sweep up all of your hair into a side ponytail and secure with an elastic. 5. Use a small piece of hair to wrap around the elastic and conceal it. Tuck the end of this piece into the elastic and secure with bobby pins. 6. To start a standard fishtail braid (this is the easiest and my favorite braid to do, since it only involves 2 sections! ), separate the ponytail hair into two sections and grip with your hands. 7. Take a small section from the outer edge of Section 1, bring it over to the inner edge of Section 2 and let it join that section. Repeat on the other side. Take a small section from the outer edge of Section 2, bring it over to the inner edge of Section 1, and let it become part of that section. Repeat this process all the way down – whether you choose to do large sections or very thin ones like a traditional fishtail, just make sure to do even sections of similar-sized pieces. 8. Tie off the braid with a thin elastic in a color similar to your hair. Use a small piece of hair to wrap around and conceal the bottom elastic. 9. 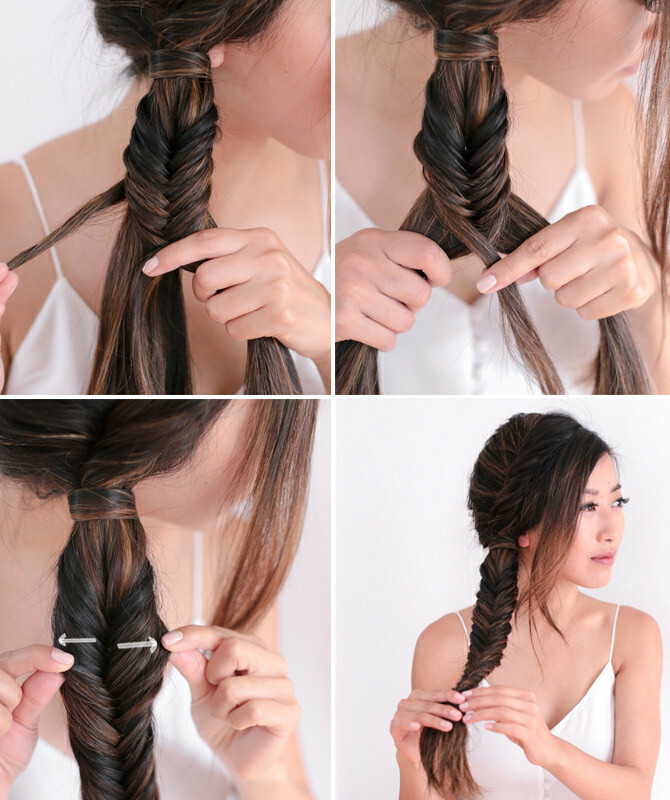 To make this a looser, softer fishtail braid, use your fingers and gently pull out sections of the braid at the loops. Don’t worry if small pieces fall out, as it can be part of the messy braid look. 10. Using a curling iron on low heat, gently curl any small pieces framing your face in the direction away from your face. Optional: For the wispy, sectioned fishtail braid look as seen at Alice & Olivia, simply add additional tiny elastics throughout the mid-section of the braid. Cover each elastic with small pieces of hair, and pull out additional wispy pieces throughout the braid for a more un-done look. I kept mine as one whole fishtail here, but just wanted to show this segmented variation! 11. Finish off your hairstyle with TRES Two Extra Hold Hairspray, which has a flexible hold to still allow some movement. And that’s it! Another way I like to adjust this style inspired by the Alice & Olivia presentation is to wrap the fishtail braid up into a messy side bun. Please let me know if you end up giving this a try! This post is in partnership with TRESemmé, a product of Unilever. Great instructions and love it! Thank you for sharing! Wow I'm loving this!! Even if you stopped at the side twist pony it'd be gorgeous! Love this hairstyle on you! And that camisole is perfection! Love this hair style! It's so different! Absolutely gorgeous! Loving the 'twist' on the fishtail! I wish my hair was long enough to braid! What a pretty look! Beautiful! I can't wait to try it! I love this hairstyle and how easy it is to do! This tutorial totally makes me wish I still had my long hair so that I could pull this off. This looks gorgeous! I used to do fishtail braids all the time when my hair was long. Such a cute hairstyle! I wish my hair was thick enough to do this too haha. I can't wait for my hair to be long enough to do this. LOVE!!! Hi Jean, I really love the ASOS cardigan, it looks gorgeous on you! but they don't have size 0 and 2 available. I have been kept going back to check but no luck…. Do you know if they will restock them? Thank you. Girls you're HAIR GOALS!!! Please check out my latest blog trip to a Farfetch mansion! I had no idea fishtail braids were so easy! I definitely think I could do this to myself–must try! Wow thanks for this! So detailed, can't wait to try it out! Wow!! This looks so beautiful and perfect. I thought this was done by a hairstylist since I normally see your hair without braids. I love it. Love the hair, so stylish. Please check out my ultimate guide to visiting a hairdresser!